A predicted 51 percent growth for Android and 43 percent growth for Windows Mobile by 2014 would begin to crowd out Symbian and send the juggernaut of Apple's iOS careening toward (but not immediately off) the nearest cliff, according to IDC. 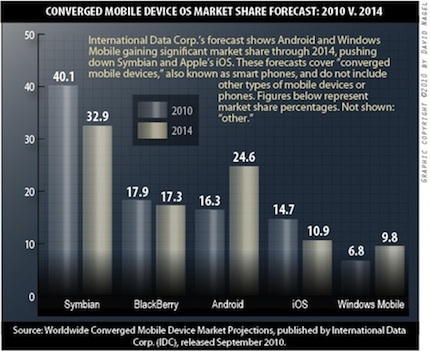 In the wake of a recent downgrade to its worldwide PC forecast, market research firm International Data Corp. (IDC) this week significantly upgraded its forecast for converged mobile devices, also known as smart phones. The company also forecast dramatically increased market share for Android and Windows Mobile at the expense of both Symbian and Apple's iOS. For 2010, IDC is now predicting total shipments of 269.6 million smart phones compared with 173.5 million units in 2009--gorwth of 55.4 percent. That's up nearly 25 percentage points from the company's 30.7 percent growth forecast released in March (based on predicted shipments of 226.8 million units). And it's vastly ahead of the pace of growth forecast for the overall 2010 mobile phone market, which IDC said would grow 14.1 percent compared with 2009. This accelerated growth is being powered in part by "an expected flurry of smartphone buying activity in the second half of the year" following new product launches, according to Kevin Restivo, an IDC senior research analyst. "Longtime operating systems leaders BlackBerry, Symbian, and Windows Mobile are about to or have already launched refreshed operating systems to compete with recent newcomers Android and iOS," said Ramon Llamas, another IDC senior research analyst, in a prepared statement. "The latter operating systems have taken away both mindshare and market share from the old regime, and have helped propel the market forward." He also indicated that Android will be a significant factor in the growth and shakeup of the market. "As the worldwide smartphone market continues to grow at a strong rate, the market dynamics among mobile operating systems continue to shift," he said. "Longtime operating systems leaders BlackBerry, Symbian, and Windows Mobile are about to or have already launched refreshed operating systems to compete with recent newcomers Android and iOS. The latter operating systems have taken away both mindshare and market share from the old regime, and have helped propel the market forward." Beyond 2010, smart phones will continue to see strong growth, IDC predicted, despite the weak economy. In 2011, growth will be 24.5 percent, though that will continue to slow through 2014, when growth will be a smaller (but still substantial) 13.6 percent.